The pattern seemed pretty easy, so I decided to make these last year. 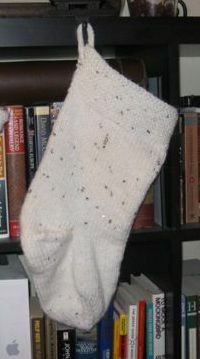 The first obstacle I ran into was cost–the yarn that Martha suggested using would have set me back about $150 for 3 stockings (one for Robby, one for me, and one for Lucy). Yikes. I ended up substituting some cheaper sequined and mohair yarns that I found on a Turkish website (which generated a “possible fraud” call from the Visa folks… :)), but I think the gauge was different. 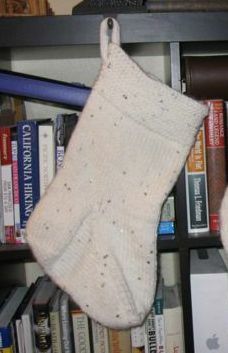 It ended up being really difficult to work with, too, and I gave up the project in frustration a week before Christmas. 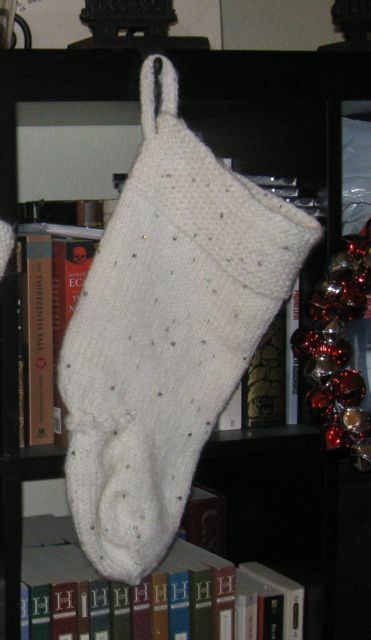 I’m glad I only needed to make 3 stockings, because I was pretty sick of the whole thing by the time I was done. I’m not really happy with the way the stockings turned out, either. I imagine someday I’ll try again, adapting the pattern to correct the gauge, and maybe springing for the expensive yarn that Martha recommended. But right now I can’t even fathom trying to start over. I’ve got a whole slew of new projects I’d rather be working on! They are so cute. I’m proud to have a daughter-in-law who loves crafting like me. 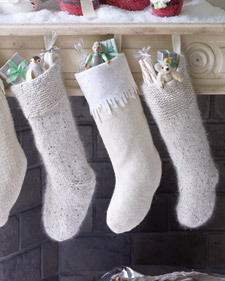 Oh Kim, I gotta give you credit for persevering through three stockings. I would have given up after the first one I’m always impressed with people who know how to knit, it just looks too complicated to me.